Landa Corporation has announced details of its Nanographic Printing Presses that it hopes will transform mainstream commercial, packaging and publishing markets. The company is launching six presses – three sheetfed and three web presses – at drupa 2012 that the company says will enable print providers to produce short-to-medium run lengths at unmatched cost-per-page. The NanoInk colorants comprise pigment particles tens of nanometres in size which absorb light and enable high image quality. The process cuts out post drying allowing two-sided printing to be handled right away. The design uses a touchscreen system where all the functions, such as ink levels, paper supply, and operational status, are clearly displayed. It’s user-friendly and does not require a high degree of training for use. A single operator can manage two to three presses at a time. 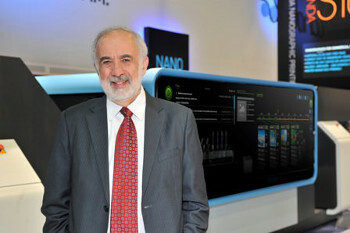 Benny Landa will be hosting five daily theatre presentations in its stand at drupa entitled "Nano. Bigger Than You Think." On May 3rd, he will deliver the opening keynote address at the drupacube theatre in Hall 7, entitled “Print in the Digital Era: How I Learned to Stop Worrying and Love the iPad.” In his address, Benny will share his insights about the printing industry, past, present and future.